CD8+ T cells are essential for effective immune defence against intracellular microbes and neoplasia. However CD8+ T cell dysregulation can have devastating effects such as autoimmune disease, leukaemia and transplant rejection. 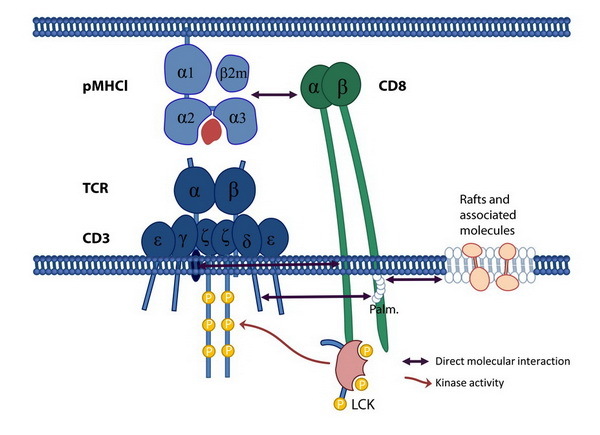 The TCR/pMHCI interaction: determines antigen specificity. Promiscuity is a characteristic feature of this interaction and it is essential for effective immunity. The pMHCI/CD8 interaction: has a potent ability to tune the antigen specific immune response by a number of different mechanisms. We are interesting in understanding both of these interactions and how to manipulate them for therapeutic benefit.